Duke University will expand on its commitment to a strong humanities curriculum and forge new collaborations beyond campus with a $3 million grant from The Andrew W. Mellon Foundation, President Vincent E. Price said Friday. Piloting a new teaching partnership with Durham Technical Community College. Humanities Unbounded will build on the success of Humanities Writ Large (HWL), an initiative aimed at changing the role of the humanities at Duke. HWL supported labs that integrated undergraduates with faculty and graduate students engaged in humanities and social science research. With Humanities Unbounded, Duke seeks to scale up these efforts, such as embedding the humanities’ lab structure into humanities departments and curricula. “We plan to develop nine humanities labs over the course of the grant, and we believe this will create innovative and flexible educational pathways that will expose more Duke students to the richness of humanistic thinking and its exciting research possibilities,” said Gennifer Weisenfeld, dean of the humanities. The program will be led by Weisenfeld, an art historian; historian Edward Balleisen, vice provost for interdisciplinary studies; and Ranjana Khanna, director of the John Hope Franklin Humanities Institute at Duke and professor of English, women’s studies, and literature. Humanities lab funding will support course development, research assistance, graduate student training, website and multimedia production, visits by external partners, research trips, student projects, and faculty and staff training in lab development and operations. 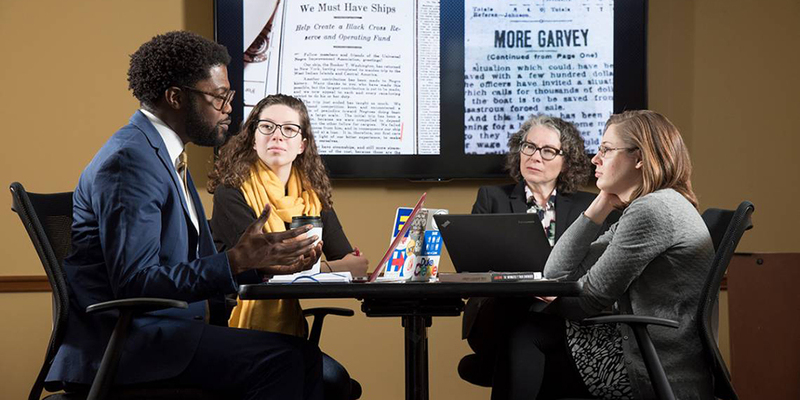 Humanities Unbounded will strengthen connections with liberal arts colleges and HBCUs through a series of two-year visiting faculty fellowships. The first year will be spent in residence at Duke, where fellows will conduct research and develop collaborative relationships. During the second year, fellows will receive funding to share their Duke experiences with their home campuses after returning to teaching, and to continue research collaborations. Humanities Unbounded will also pilot a teaching partnership with Durham Technical Community College, which serves a diverse population of 20,000 students. The pilot will pair graduate student research assistants from Duke with Durham Tech faculty. The pairs will then work to develop innovative teaching modules that could include collaborative research, community‐based oral histories, the reorientation of syllabi around a case study approach, or the development of online resources. The project will focus on Durham Tech courses eligible for transfer credit, thereby preparing students to continue at four-year institutions.